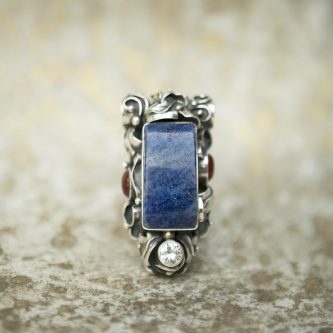 A confidence, manifestation, and freedom stone; Lapis amplifies inner wisdom. It takes away conceptual and emotional limitations and aids in the release of old karma. Lapis increases awareness, insight, and intellect while enhancing leadership qualities. One of the most honored stones in the world, all ancient cultures utilized its powerful wisdom; believing that knowledge brings with it peacefulness, objectivity, and self acceptance. Lapis helps with legal matters and has the ability to shield the wearer from psychic attacks. Physically, it stimulates optic nerves and memory, and helps to heal neurological imbalances. It is also used to receive insomnia and let go of anxieties.